Lightning is Florida's top weather killer and still a source of mystery for scientists. One of their areas of study is upward lightning — bolts that travel skyward from tall objects such as wind turbines — a phenomenon that can damage these energy sources, which are springing up all over Tornado Alley. 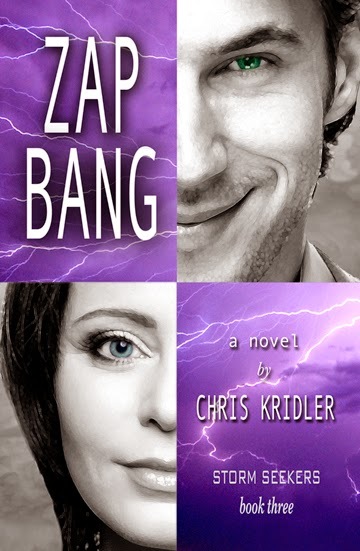 This type of lightning especially concerns the storm chasers in Zap Bang storm chaser and writer Chris Kridler's third novel in the Storm Seekers trilogy of storm-chasing adventures. The story opens on Florida's Space Coast and continues with adrenaline-filled storm chases in Oklahoma, Kansas and Nebraska. "I've been a storm chaser for 18 years, and one of the most underrated dangers of the chase is lightning. It's unpredictable and deadly," Kridler says. "It also makes for a great natural foe for the characters in my novel, who have to confront both tornadoes and lightning during a research project in Tornado Alley." Zap Bang brings back expert tornado chaser Jack Andreas, who's invited to join a lightning study. Tornadoes plus lightning equals double the danger; as he sees it, what's not to love? He's intrigued by the job and fascinated by pilot Maribeth Lisbon, who must fly a research plane into the zap zone. Maribeth suspects he's trouble, especially when his charms set off all her alarms. In their way are scheming TV chaser Brad Treat and down-on-his-luck adventurer Aurelius Zane, intent on filming a wedding in front of a twister. The eccentric billionaire who funds the study has a secret agenda. And a mystic with a food truck tests them all. As fearsome storms put them in mortal peril, Jack and Maribeth find their toughest challenge may lie within. This entertaining novel, the sequel to Funnel Vision and Tornado Pinball concludes the Storm Seekers trilogy with action, drama, humor and romance. It also draws on reality. The story's storm chasers use high-speed cameras that shoot lightning at such a high rate that you can see every lightning leader and branch as it unfolds. And the pilot flies an A-10 Warthog, a warplane that's been converted for research. The National Science Foundation is currently refurbishing such an airplane to study severe storms and hurricanes. Kridler, a veteran journalist and photographer as well as a novelist, has worked at Florida Today, The Baltimore Sun and The Charlotte Observer, covering space, features and the arts. Her photos have appeared in magazines and on book covers; she was featured in Popular Photography; and her video has appeared on numerous television shows. She won the Best Documentary award at the 2011 Melbourne Independent Filmmakers Festival for her short film "Chasing Reality," about the realities of storm chasing. Originally from Pennsylvania, she went to the University of North Carolina at Chapel Hill and lives on Florida's Space Coast.